fullness. Satiety is a key component in effective weight management. 2) Cholesterol control - Soluble fiber (eg. oat bran, inulin) may control cholesterol levels. 3) Diabetes management Type 2 - Soluble fiber helps stabilize blood glucose in Type 2 diabetics. requirements in Type 1 pregnant women. 5) Detoxify - Fiber effectively removes toxins from your intestines. inflammation recognized as predictor coronary heart disease and diabetes. 7) High blood pressure - Dietary fiber may contribute to the prevention of hypertension. 9) Breast cancer - Fiber appears to reduce breast cancer risk. 10) Relieving constipation - Insoluble fiber helps relieve constipation by providing bulking in the intestines. Consult your Healthcare Advisor before starting any program or modifying any medications. What is a muffin anyway? Traditionally, a muffin is a quick bread that is sweetened and may contain nuts or fruits. Traditional muffins are loaded with sugar, fat and white flour. Miracle Muffins are designed with no sugar, flour or added fats. 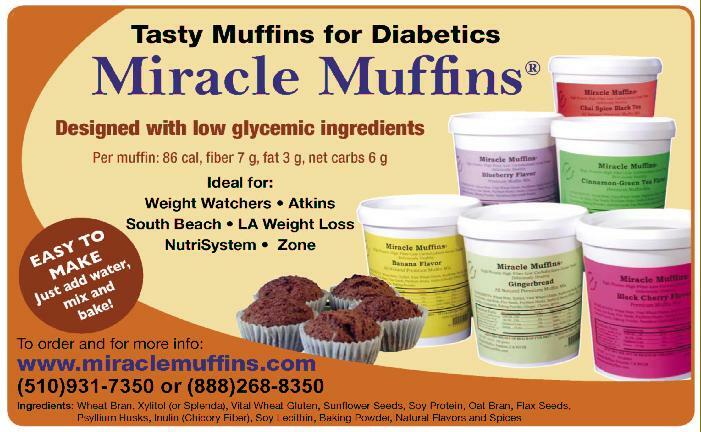 These muffins are designed to be diabetic safe. They are also compatible with Weight Watchers, Atkins, South Beach, LA Weight Loss, Zone, NutriSystem and Seattle Sutton. World's Healthiest Muffins. Diabetic sugarfree muffins.